This four-part article is a short, popular version of some of the material which appeared in Rudhyar's 1946 book The Moon and Its Cycles - which was a precursor of sorts to Rudhyar's seminal 1967 book The Lunation Cycle. Your Lunation Birthday provides an abbreviated and accessible introduction to the lunation cycle and the eight lunation types. 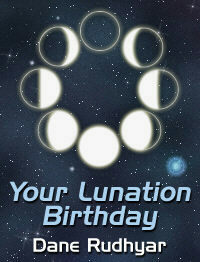 If you find Your Lunation Birthday useful, please refer to The Lunation Cycle - use the link below to purchased it from Amazon.com - for a fuller and more significant treatment of the subject. » How to Interpret the Lunar Nodes. This two-part article is an excellent guide to the Lunar Nodes in astrology. Part One explains the significance of the Lunar Nodes in birth-charts, and Part Two explores the 19-year transit of the Moon's nodal axis around the birth-chart. » The Moon's Nodes at Birth shows the place and meaning of the Lunar Nodes in natal astrology. It examines the significance of the Moon's Nodes in the houses of a natal chart and the importance of natal planets situated on the Moon's Nodes. » Neptune - Mother of Myths, Glamour and Utopias. In the fascinating article Rudhyar explores the many faces of Neptune and how its passage through the zodiacal signs symbolizes generational characteristics. » The Clock of Your Inner Life. This accessible article is an excellent introduction to the meaning and significance of progressions in astrology. » How to Integrate Spontaneity and Planning shows how structure and spontaneity corresponds respectively with the astrological planets Saturn and Venus. » Fouth Degree of Scorpio. Here's one of Rudhyar's most prophetic articles. Written during October 1966, in this engaging piece Rudhyar foresees a great turning-point in human evolution coming for mid-1967. » Meditations on Saturn. In traditional astrology Saturn is known as the great malefic - the big bad guy. But is the reputation justified? or does Saturn symbolize organic functions as necessary as any other astrological symbol? Take an unbiased look at this misunderstood astrological symbol. » The Eighth House and Business. A fascinating and informative article serving a dual purpose - it sheds new light on the little understood eighth house, and also shows how the meaning of each of the twelve astrological houses unfolds. » The Harmonic Approach to Astrology. » Find Yourself in Your Horoscope. » Keynotes of Personal Unfoldment - Progressed Lunation Charts. » What Is My Nature? See It In Your New Moon Before Birth. » Astrology and the Kinsey Report. » Happiness in Life's Middle Years. » One Is Never Too Old To Begin Again. » What Do the Natal Houses Represent? » Uranus vs. Saturn - The Value of Inconsistency. » Two Levels of Love. You belong to the New Moon Type, if you were born at New Moon or within the three and one-half days following New Moon (Moon less than 45° from Sun). Your typical personal characteristics are: a strongly subjective, emotional and impulsive approach to life and to everything that attracts your attention; a tendency to be emotionally confused or to reach out eagerly toward some deeply felt compelling goal, to project your feelings upon people and situations, without much regard for what these actually are in themselves. You belong to the Crescent Type if you were born from three and one-half to seven days after a New Moon. Your typical personal characteristics are: determined self-assertiveness, active faith, the eager desire to carry out an inwardly felt command and to clear the way for the fulfilling of new goals; negatively, a sense of frustration and of struggling against too great odds. Examples of the type: Louis XVI, Abdul Baha, Franz Liszt, Ralph Waldo Emerson, Andrew Carnegie. You belong to the First Quarter Type if you were born from seven to ten and one-half days after a New Moon. Your typical personal characteristics are: strong will and organizing ability, the instinctive rebellion of the man of action against a binding or inadequate social-ideological tradition, ability to make decisions — at times, ruthless ones; self-exaltation in the thrill of activity and overcoming difficulties, negatively, a sense of defeat. Examples of this type: Joseph Stalin, Oliver Cromwell, Walt Whitman, Baudelaire. You belong to the Gibbous Moon Type if you were born from ten and one-half to fifteen days after a New Moon. Your typical personal characteristics are: a desire to improve yourself and others, to evaluate things and people, to handle symbols of value (including money), to bring a social trend to a conclusion; devotion to a personality you consider great, self-overcoming, yearning for more light. Examples of the type: Count Hermann Keyserling, Louis Pasteur, George Gershwin, J. P. Morgan. You belong to the Full Moon Type if you were born from fifteen to eighteen and one-half days after a New Moon (i. e., less than three and one-half days after Full Moon). Your typical personal characteristics are: mental objectivity, the ability to make ideals concrete, to receive illumination or "visions" and to give them symbolic expression, to fulfill the past; negatively, a sense of being divorced from reality and divided against oneself. Examples of the type: Goethe, Rudolph Steiner, Krishnamurti, Mary Baker Eddy, Evangeline Adams. You belong to the Disseminating Type if you were born from eighteen and one-half to twenty-two days after a New Moon or three and one-half days to seven days after the Full Moon. Your typical personal characteristics are: the ability to demonstrate to others what you have learned or envisioned, to disseminate ideas, to participate in social-religious movements and to fight for what you see as the right, to be a crusader and a disciple; negatively, to become lost in social or moral fights, to develop mental confusion or fanaticism. Examples of the type: Thomas Jefferson, Disraeli, Teddy Roosevelt, Hitler, Bismarck, Richard Wagner. You belong to the Last Quarter Type if you were born twenty-two days after a New Moon or seven days before the next, or about seven to eleven days after the Full Moon. Your typical personal characteristics are: the ability to manage and organize people on the basis of ideas and social-political concepts, the eagerness to force issues and to produce crises, to change people's beliefs, to reform and transform, to build ideological structures or systems, to work hard toward some future goal regardless of the immediate results; a tendency toward humor or the inability to take criticism; a dictatorial attitude. Examples of the type: Gandhi, Annie Besant, Lenin, Trotsky, Mussolini, George Washington, G. B. Shaw, Victor Hugo. You belong to the Balsamic Moon Type if you were born from twenty-five and one-half to thirty days after a New Moon — or less than three and one-half days before the next. Your typical personal characteristics are: an eagerness to serve social institutions and organized groups, to bring the past to a conclusion and to sacrifice yourself for the future's sake, to become completely identified with great ideals or causes regardless of consequences; prophetic gifts, a sense of personal destiny, of being led by superior powers, of finality in all things and in all your judgments. Examples of this type: Thomas Paine, Abraham Lincoln, Cecil Rhodes, Havelock Ellis, Robespierre, Kant.